What is a Client Based Calibration Lab (CBL)? You are an expert at what you do; let Transcat be your expert at what we do. Our CBL service option is a Transcat-operated calibration lab tailored to your needs and located at your facility. 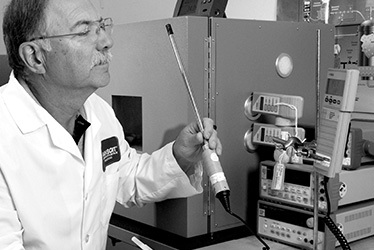 We set up, staff, manage and run your facility's calibration lab based on your needs and quality standards. This allows you to focus on what you do best and still have an outstanding calibration program to make what you do best, the very best it can be. Your Lab, Your Facility, Transcat Expertise. CBL customers have access to all of Transcat's metrology experts, calibration software, and datasheets. CBL is tailored to your specific needs based on multiple meetings with Transcat metrology experts. CBL is at your facility, saving you time and overhead in preparing and shipping instruments to a calibration service provider's lab offsite. Transcat's metrology experts can help you spec in the right instrument for the job every time helping you ensure the suitability of that instrument to your measurements. Transcat manages multiple CBL for companies in various industries including medical device, life sciences and manufacturing. One of those sites has even achieved 17025 accreditation. Contact Transcat discuss how to set up a CBL at your location!